Whispers in the Loggia: "How Can I Not Denounce the Injustices You Suffer?" 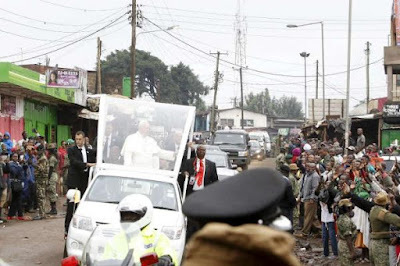 – In Nairobi Slum, Pope Defends the "Neighbors"
"How Can I Not Denounce the Injustices You Suffer?" – In Nairobi Slum, Pope Defends the "Neighbors"
As papal travel has evolved over the last half-century, the journeys of successive Popes have come to be among the most revealing moments for the personality of each – part from being on display for days on end at close range, sure, but above all in the commitments each chooses for himself. On a broad-stroke level, beyond the major, practically default set-piece events – large, open-air Masses; relatively private encounters with civil officials and leaders of the local church, and a stop at a relevant landmark or two – the last three pontiffs have each carved out occasions on the road to reflect their own personal affinities and, through them, their priorities in governance. For John Paul II, that meant a prevalence of stops at seminaries, meetings with young people (and anything else for which a massive crowd could be rustled up), while Benedict XVI's life before Rome saw Papa Ratzinger veer for the friendly confines of universities or engaging the world of culture and the rarefied public square. In his turn at the pontifical triptik, over 11 overseas journeys to date Francis' concerted insistence for his "open time" has become more than clear, and – surprise, surprise – it's a conspicuous shift: in a nod to what he's repeatedly cited as "the protocol by which we all will be judged," every visit now hinges upon what can be called the "Matthew 25" stops: that is, an outreach to some mix of the sick, migrants, prisons, the poor... in a word, "the least brothers" of whom Jesus said "whatever you did for [them], you did for me." 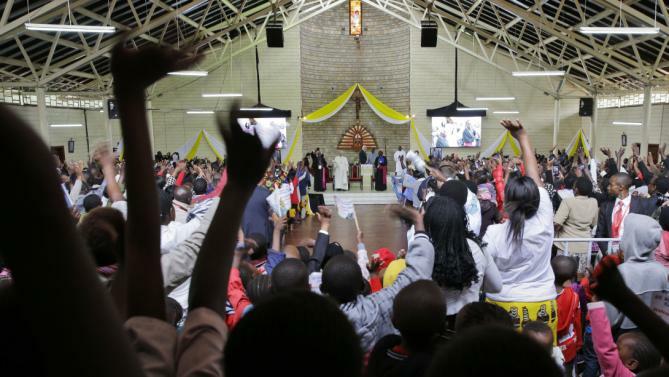 "I examine my conscience with this chapter," Francis told a 2014 audience – "Every day." Granted, the significance of the stops often flies over the heads of those mining everything else for secular intrigue or culture-war ammo, but the local organizers of today's visits don't have that luxury – if anything, while doing its initial site searches on the margins, the Vatican advance team quickly puts the hosts on notice that "these [moments] mean the most to the Pope." And they're accordingly situated as such: indeed, it was anything but accidental that Francis went straight from addressing Congress to visit Washington's homeless, or the moving yet logistically-challenging stop at Philadelphia's major prison was Papa Bergoglio's last event before his US visit's climactic final Mass. As each unfolds, meanwhile, it has at least gone noticed that Francis' fleeting returns to his beloved "peripheries" – albeit accompanied by a phalanx of media, security and the ticking clock – find the pontiff at his happiest and most unguarded: simply put, he's back among his own, far from the pomp and pretense of civic or ecclesial officialdom. I feel very much at home sharing these moments with brothers and sisters who, and I am not ashamed to say this, have a special place in my life and my decisions. I am here because I want you to know that your joys and hopes, your troubles and your sorrows, are not indifferent to me. I realize the difficulties which you experience daily! How can I not denounce the injustices which you suffer? This situation of indifference and hostility experienced by poor neighbourhoods is aggravated when violence spreads and criminal organizations, serving economic or political interests, use children and young people as “canon fodder” for their ruthless business affairs. I also appreciate the struggles of those women who fight heroically to protect their sons and daughters from these dangers. I ask God that that the authorities may embark, together with you, upon the path of social inclusion, education, sport community action, and the protection of families, for this is the only guarantee of a peace that is just, authentic and enduring. In this regard, I would propose a renewed attention to the idea of a respectful urban integration, as opposed to elimination, paternalism, indifference or mere containment. We need integrated cities which belong to everyone. We need to go beyond the mere proclamation of rights which are not respected in practice, to implementing concrete and systematic initiatives capable of improving the overall living situation, and planning new urban developments of good quality for housing future generations. The social and environmental debt owed to the poor of cities can be paid by respecting their sacred right of the “three Ls”: Land, Lodging, Labour. This is not philanthropy; it is a moral duty upon all of us. 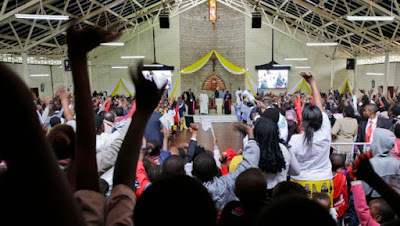 This afternoon sees Francis' departure for his African tour's second leg in Uganda, where – after civil formalities tonight – a Saturday morning Mass will take place at the shrine that pays joint tribute to the country's 19th century Catholic and Anglican martyrs, the former of which were canonized by now-Blessed Paul VI on the first ever papal visit to the continent in 1964. As a critical mass of historians cites the roots of the execution of the 45 men in their resistance to the aggressive homosexuality of a tribal king, the Pope's message at the site could potentially make for a flashpoint that resonates well beyond this weeklong trek.